This is a blog post about an Orlando family session at the Hard Rock Hotel and Universal Studios. 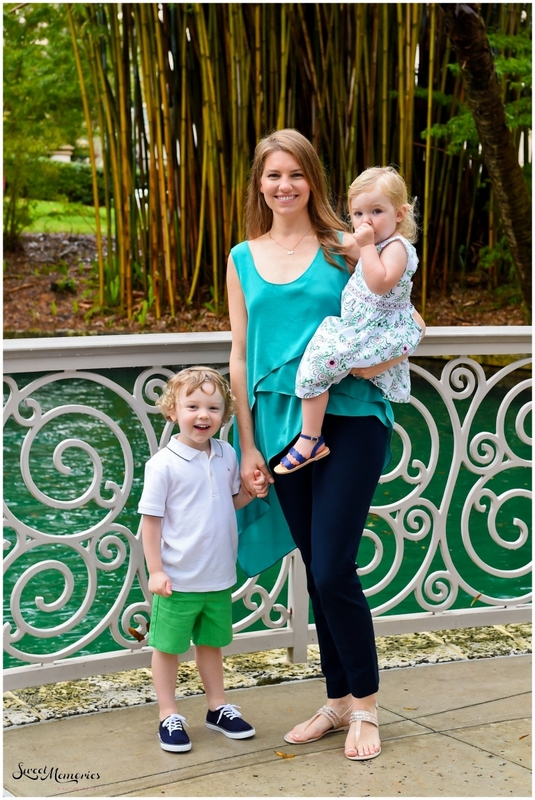 With two adorable kids, the handsome Meehan and DePrenger family were on vacation. Visiting from Virginia, Michelle (mom of the two little ones) reached out and requested a family session. Michelle and I were college friends. We were both art majors and since the department is relatively small, we had a lot of classes together. Having met in a drawing class initially, we connected and have been friends ever since. So close, in fact, that we were bridesmaids in each other’s weddings. Michelle and her family also hire me for special occasions, like this one. For once, their family was together and wanted to document not only coming together, but also a little of their family vacation. Unfortunately, Michelle’s husband got called away for work last minute (although, I wouldn’t complain if I got called away to the Netherlands!). Guess this just means we’ll have another session in the near future! Our time together was short but amazing! We started our session at the Hard Rock hotel where they were staying. The grounds of this hotel are beautiful, with man-made bodies of water, bridges, gardens, and beautiful walkways. Little Nora didn’t take to the camera. She was definitely more interested in whatever was on the ground or in the water … Love this shot with grandma walking with Nora. I think we found Nora’s favorite person… Big brother Jack leading his baby sister! Age or size doesn’t matter! Nora loves pushing her big brother around in the stroller, and Jack loves it, too! Sibling love: Michelle with her (not-so-little) brother. Sometimes you may not get a good family portrait, but you get some good play time! Nora was not having it (obviously). But I love this picture for the sole purpose that it tells a story! She’s letting us know that she doesn’t want her picture taken with grandpa and big brother. Big brother is trying to figure out what’s the big deal. Grandpa is just amused! Unlike his little sister, Jack was having a great time having my full attention. Skipping, dancing, hopping, and showing off, Jack was having the time of his life! All was well with the world once Nora was in mommy’s arms. Almost a full family portrait! With Michelle’s husband, Brian, working in the Netherlands and her mom having to take a conference call, we were able to get a partial family picture! Lucky for us, Michelle is a graphic designer. Maybe she can photograph the two in?! This awesome life-sized game was by the Hard Rock Hotel‘s pool. I loved getting candids of little Jack playing with his uncle. What I noticed about Nora is that she twirls her hair. Because I am obsessed with capturing personalities and little quirks and habits, I had to photograph this. What’s even better is that the Hard Rock is connected to Universal Studios. So this is where our Orlando family session changed scenery, and we headed on over to the park to Universal Studios and Dr. Seuss world … Nora loved the carousel, if you couldn’t tell! In fact, she rode this a few more times with grandpa, even after Jack, Michelle, and I left for another ride. We finished our session in the mini splash area where the kids were the happiest. We finally got real smiles out of Nora and I have to say, her smile is the CUTEST! “Most beasts are quite friendly, but still, in some lands … Some beasts are too dangerous to catch with bare hands.” What do you think? Is Jack a friendly beast? Or too dangerous to catch with bare hands?